CW (continuous wave) or Morse code (named after its inventor Samuel Morse) is the oldest way to transfer text, we control the transmitter with an on/off key and the dashes and dots result in characters. With bi-phase shift keying (BPSK) we don’t, instead we leave the transmitter on while we transmit a short message. Mathematically you can show that the second technique works better. The Fourier transform of a square wave looks ugly, in particular the odd harmonics of the base period repeat almost forever. In order to prevent that this happens we shave off the edges to make the square wave behave better in the radio spectrum. If you don’t then key-clicking is the result, which could potentially lead to complaints from your neighbors or the government responsible for monitoring the spectrum. CW also has other ugly aspects, namely, that the power supply varies between low and full load so that the voltage may drop affecting for instance the frequency of the oscillator. Sometimes you hear this as chirping in the CW code. With BPSK there is no key-clicking because we leave the transmitter on, but, in order to transmit dashes and dots we change the phase of the carrier as indicated in the above figure. An OFF in CW has a zero-phase in BPSK, and an ON in CW has a phase of 180 degrees. The BPSK acronym stands for Bi-phase Phase Shifted Key, it was introduced in space communication for instance with the introduction of GPS in 1980 where just 27 Watt is transmitted at 20000 km altitude with a directional helix antenna so that it appears for us on the ground as a 500 Watt antenna in the sky. The more generic name that covers BPSK is phase shifted keying or PSK because more than one phase setting may be used, also, the rate at which we send the ones and zeros in PSK may vary. PSK also found its application in ham radio, near 14070 kHz you can receive PSK signals with any USB receiver. But the fun is that we can also transmit PSK signals by providing the an audio signal generated by your PC to your transceiver. There are several implementations of PSK, you can generate for instance BPSK at different speeds, best known are PSK-31 and PSK-63. Also you could generate more than two phases, like 4 in which case you get QPSK code. Finally you could also apply an amplitude variation together with phase modulation, an example is QAM. For sake of simplicity I will stick to what most people do on HF, and that is PSK-31 or PSK-63 modulation. When you listen to BPSK on HF it sounds like a faint whisper, the demodulator in MMVARI (a windows program on your PC) picks it up and displays the message in the upper text box. What you reply is like in CW traffic, use your call sign and exchange reports etc etc. The efficiency of the information transfer is incredible, under mediocre HF propagation conditions I was able to establish contact with stations on the East coast of the Black Sea in the early morning, later in the morning with Sweden and Italy. There are also PSK monitoring networks like pskreport that generate reports of what you’ve sent. In the evening you will see that stations on the east coast of the US pick up the transmitted signal. I used the MMVARI application on my PC together with the micro keyer 2 to generate PSK-31 and PSK-63 code. In the beginning nobody returns an answer to what you send because the transmitter really needs an audio in signal from the PC (Even I make these mistakes is what you say after it did not work). Plugging in the RJ-45 cable is what I avoided so far but there is no other way to make the Yaesu FT-991 process the sound generated by the MMVARI program. Another tricky aspect with all PSK modulation is not to over modulate the SSB transmitter. There is a ALC meter on the FT-991 that shows the automatic level control of the end-stage and there is a transmitted power meter. It is however not clear to me what the ALC meter on the FT-991 really shows, I’m inclined to believe it shows the same thing as the PO meter, so equivalent to power delivered by the transmitter. PA0HPV Henk explained me that if the transmitter can output 100W then PSK modulation has to stay at about 1/4 of that maximum, roughly 25W. The best option is to put a dummy load on the transmitter PL-259 jack and to inspect with an oscilloscope via a T-connector between the TX and the dummy load to see what comes out. Poorly modulated PSK signals lead to splatter, and this is what you want to avoid. Occasionally you see PSK signals in the spectrum that show this behavior. I guessed at this point what the proper audio level was, at some point ham operators responded to my BPSK calls which is a sign that apparently something is transmitted and recognized. The optimal PSK settings are on my list, this is something I have to look into as soon as I have a dummy load and the required T-connector. The image below shows mostly receivers connected to the internet that skim the allocated frequency bands for any PSK activity. It shows that my signal was automatically picked up and reported to the pskreporter.info webserver, these are the balloons in the plot. Reception reports are convenient for investigating HF propagation characteristics. There are similar websites like WSPR where radio amateurs cooperate by transmitting low power PSK signals and reporting the received signal strength. BPSK reception report, made on the 28th of April the day after I worked on PSK. Not all receivers in the map saw my transmissions, but the signals were seen from the East Coast of the USA up to Kazachstan. The HF propagation on 20m was mostly East West apparently, the F10.7 flux was also low, around 90 but under 100 and the Kp index was slightly elevated which works against stable HF propagation. An earlier version of this web page showed a different version. 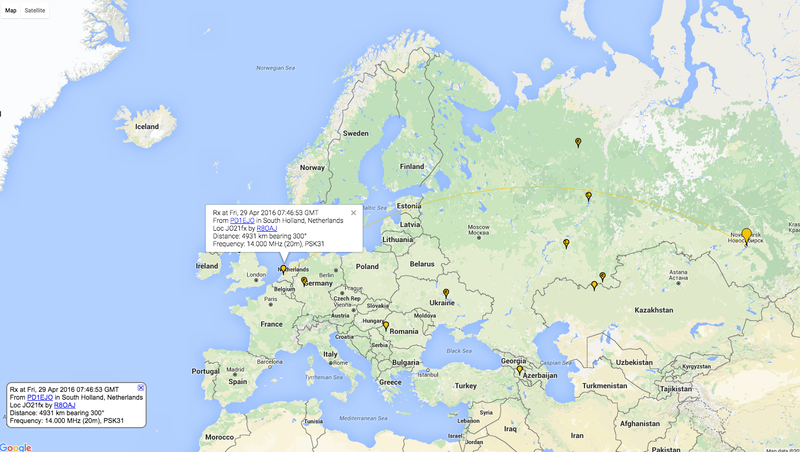 This morning stations I had several QSO’s and pskreporter.info showed that the signal propagation did not reach further than Turkey and the Ukraine, until I looked again to see that R8OAJ saw the PSK-31 in Novosibersk 4932km to the East, about twice as far as the usual 2000 to 2500 km. I wonder whether it is real.